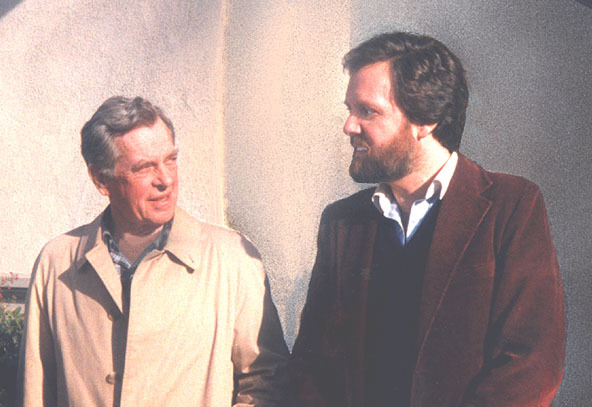 Photo by "Folkstory" features Joseph Campbell (left) with Jonathan Young, via Wikimedia Commons. You may not be interested in politics, they say, but politics is interested in you. The same, if you believe famed mythologist Joseph Campbell, goes for myth: far from explaining only the origin of the world as believed by extinct societies, it can explain the power of stories we enjoy today — up to and including Star Wars. "From the Star Wars trilogy to the Grateful Dead," says the Joseph Campbell Foundation, "Joseph Campbell has had a profound impact on our culture, our beliefs, and the way we view ourselves and the world." This collection, The Lectures of Joseph Campbell, which comes from early in his career, offers "a glimpse into one of the great minds of our time, drawing together his most wide-ranging and insightful talks" in the role of both "a scholar and a master storyteller." So not only can Campbell enrich our understanding of all the stories we love, he can spin his lifetime of mythological research into teachings that, in the telling, weave into a pretty gripping yarn in and of themselves. I just downloaded Spotify in order to listen to the Joseph Campbell series. I still cannot open the lecture series. When I try to open the first audio file, I get a screen asking me to sign up and when I do it tells me I already signed up. I have a Mac. What do I need to do? Hey noelle, I have a Mac too. I also downloaded Spotify, free version, logged in with Facebook, then clicked on the symbol above, top right of the little play rectangle on this page, copied the link and pasted into the search field of the Spotify app. I just clicked on search button on Spotify and put his name in. then all came up. Anyone know if this can be downloaded somehow to be listened to offline? Spotify????!!! Really???? Just put them here and let the people download them. Why try to saddle us with a service/software WE DO NOT WANT!!!!!! In response to if they can be downloaded for offline listening – only with Spotify premium. BUT i do recall seeing an ad on their site today of a premium 3 month trial for only 99 cents the first 3 months. I have personally listened to most all the lectures Spotify has of Campbell and they are nothing short of mesmerising at times. The spark this guy emits when speaking about many topics that could so easily be taken as dry and meaningless by a less inspiring speaker. When looking up lectures initially on Spotify, they were often mixed up tracks. There is a playlist called verbatim “The Lectures of Joseph Campbell” that has all albums (each album is one full lecture broken up into several tracks.) And tracks in order so you can easily pick up listening where you left off. I thought open culture was free source material not demanding that we have subscriptions to spotify? I wish I could just download the mp3s. Yeah, what’s with the proprietary streaming service lock-in?? If you can’t host them directly due to bandwidth costs, why not upload this to the Internet Archive or host a torrent? So much for Free Culture. Thanks @ Mr. Colman for finding this and making it available to all of us, and to those who still have nothing better to do than to complain.. Do it better!!! First of all thank you to the person who decided to upload these to Spotify. You brought to my attention that these other recordings of Joseph Campbell existed! Also, if you would like to have access to these same teachings but in a form that is uninterrupted by spotify adds and presented in a random order you can go to the below link and download any or all of them onto your computer by using their torrent. Then you could use either itunes or google drive to get them to your phone for easy listening. I recommend Utorrent if you do not already use a torrenting software. Although torrenting is usually associated with downloading things illegally it is also a viable way to acquire legally shared items such as these.